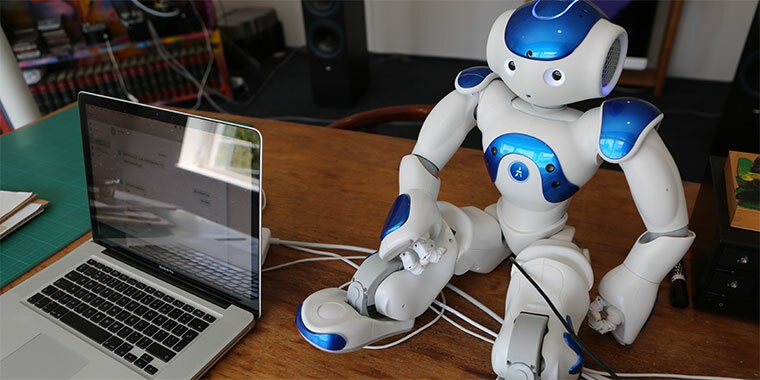 Commissioned by De Rolf Groep and Hogeschool de Kempel, PermanentMarkers went to work on the NAO robot. The aim of the project was to deploy the NAO robot to classrooms in primary education. In which we succeeded, because the software developed by Permanent markers is already used in many schools in the Netherlands, UK and soon in the USA. Read more on the website of Eddy The Education Robot. As a result of permanentmarker's latest large scale project, a lot of devops tools got developed, which are now being released under the devopsconsulting organisation on github. This will become the basis of a new startup called devopsconsulting. We will be releasing screencasts of all the tools and their function in the near future. Puppet is great. Having a repeatable installation script of a server is the best documentation there is. Configuring an entire server with all kinds of services is easy! Even when the configuration of one service updates, dependent services can be made to reload automatically. On a slightly different scale, where dependencies don't exist between services on the same machine, but on different machines, the options are limited. Xcode workspaces and external libraries. A lot has been said about Xcode workspaces. Still, when using the xcode workspace feature to add dependencies on external (static) libraries, you might find a strange linker error. How I managed to edit /etc/hosts without becoming root and still got rejected from the app store. Back in may, I was on holiday in Spain for a month. Finally without a contract, I decided to try and pick up cocoa. The new Mac OS X app store was still rather empty and especially the developer tools section was filled with useless icon resize tools. Opportunity called upon me to add something useful. PermanentMarkers launches iPhone app: Veggies. Do one thing and do it well, Veggies is a simple and effective app that provides you with the cooking times of vegetables. Instantly learn how long your vegetables need to cook in either boiling water, the steamer or the microwave.